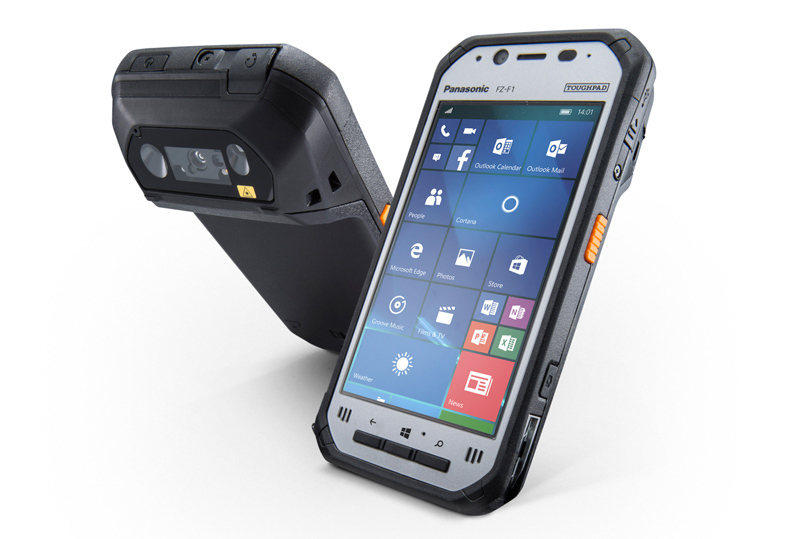 Panasonic says the Toughpad FZ-F1 is one of the thinnest and lightest smartphones in the 4.7-inch (1193mm) category and is intended for use in tough and high-risk work environments. The Toughpad FZ-F1 has 3-in-1 capabilities combining a phone, tablet and mobile barcode reader into one device. The FZ-F1 also has a long-lasting battery that can provide up to eight hours of continuous operation, useful for long days in the field. Under the hood, the Toughpad is running on a quad-core Qualcomm Snapdragon processor, has dual SIM slots and is compatible with major mobile carrier networks providing 4G LTE/3G/GPRS/CDMA200 mobile broadband. The smartphone can also connect through WiFi 802.11 a/b/g/n/ac, near-field communications (NFC) and Bluetooth. On top of that, the FZ-F1 has an angled barcode reader that has been ergonomically designed to allow the user to scan items without bending at the elbow or wrist. The Toughpad FZ-F1 wouldn’t be much use in industry without being fully rugged. The phone is durable to US military standard MIL-STD-810G, can handle high-pressure jet spray to IP66 levels, is submersible up to one metre for thirty minutes. Panasonic also says it subjected the FZ-F1 to over 2,000 consecutive one-metre drops to ensure the phone meets today’s ruggedness standards. "It’s no surprise that the rugged mobile market is expected to continue its steady growth," Panasonic Australia general manager mobile solutions Marc Amelung says. "Australian companies are realising consumer-grade products do not provide the necessary value or sophistication required to address business needs. This has resulted in thousands being lost in repair costs and days being lost each year in productivity. "The FZ-F1 will help to slash field failure rates, raise productivity and reduce work-based injuries thanks to its innovative design. Panasonic has a strong 20 year heritage in the Toughbook category and we will continue to adapt and serve businesses with our tailored solutions," Amelung adds.